Before marrying my husband, and while we dated he would always tell me “A way to a man’s heart is through his stomach.” I was like “Ha! I got this covered! I can cook, and boy can I cook delish!” Puerto Rican food is my specialty. However, I was in for a big surprise. You see, my husband is a very Southern gentleman. When I say “Southern” I refer to the South of the U.S.A. where food is soulful with varying elements of spices with African influences, where the hog (pork) is the predominant meat, and they love their greens, collards anyone? And where the main drink is sweet tea! I on the other hand am an island girl. I come from Puerto Rico where we have a fusion of tropical flavors. Our cooking style is called “cocina críolla” (creole cooking and not to be confused with Louisiana’s Cajun cuisine). “Cocina críolla” can be traced back to the Arawaks and Taínos with a combination of Spanish & African influences after Columbus arrival on the island. It was a food culture shock indeed! Needless to say, this upcoming January 2014 we will be celebrating our 6th anniversary, it’s safe to say that I have survived the food culture shock, and that I have become an expert in Southern cuisine! I can go head-to-head with any local Southerner when it comes to soul food. 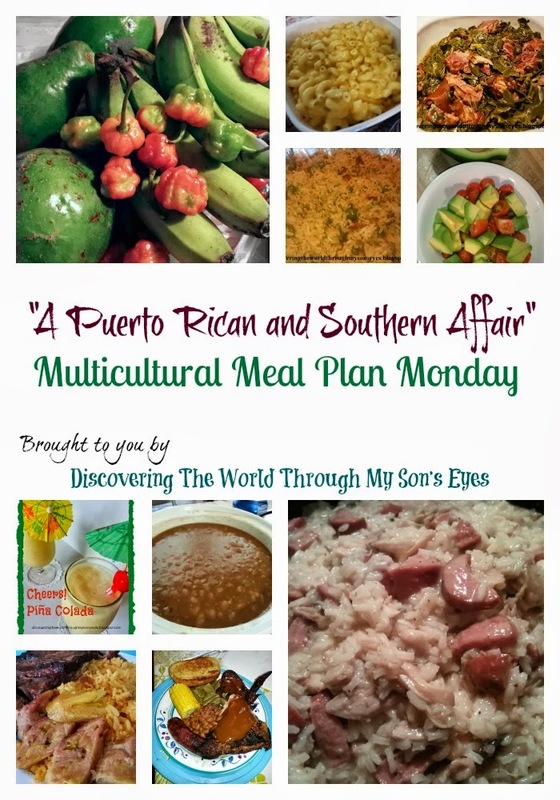 My husband has had his good share of Puerto Rican cuisine, but his heart is set on soul food. Little one thankfully has a good hearty appetite, and eats whatever his mami cooks for him especially when it’s Southern. Hope you enjoy our meal plan for this week. 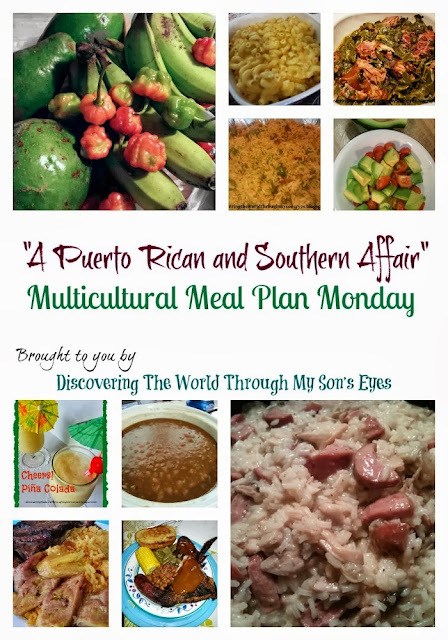 Need more multicultural meal plans? Click here. Thanks for the recipes. I am Asian but I love Island food. My good friend taught me to cook Cuban food which my family loves. I’m excited to introduce them to Puerto Rican cuisine which sounds very similar to Cuban!! I want to eat with you guys this week!! I guess I’ll have to settle for trying out some of your recipes! Thanks so much for sharing them here! !